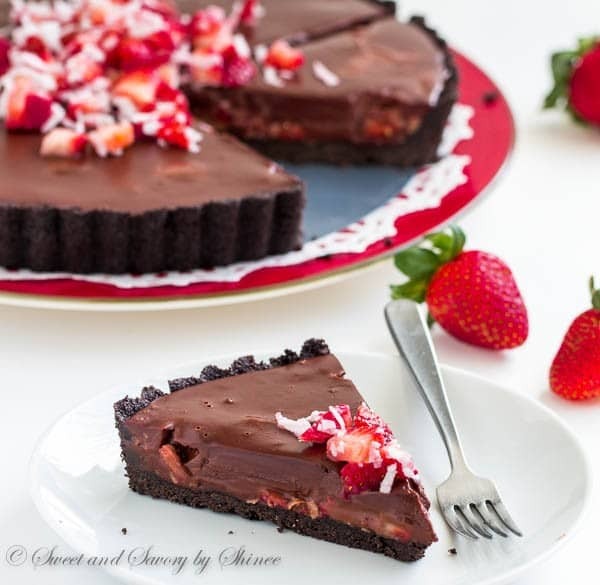 Every bite of this no-bake chocolate truffle tart, filled with fresh strawberries and coconut, literally melts in your mouth! 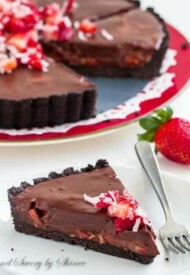 It’s chocoholic’s dream tart. Happy 1st Monday of March! Can you believe it’s March already? Winter is practically behind us. It’s time to bring out all things spring, light colorful scarves, cute little flats, bright purses, floral dresses, you name it. Well, maybe hold off on the floral dress for now, but you get the idea. Spring is in the air! 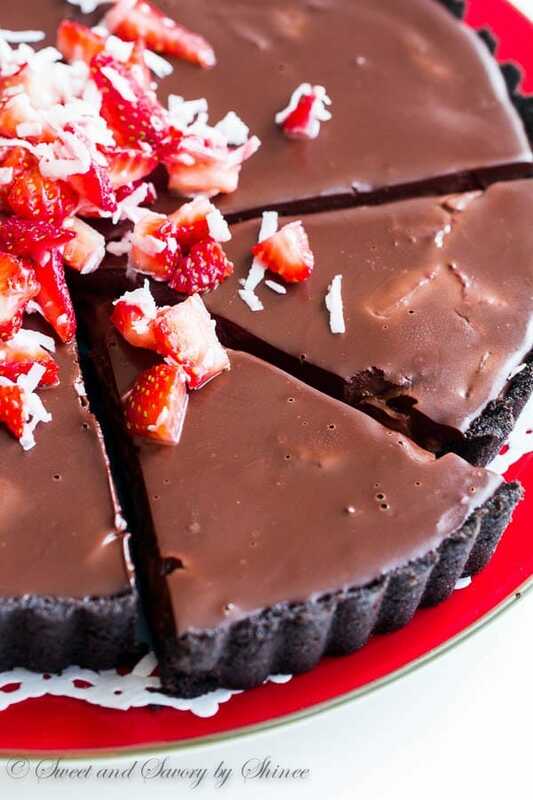 Let’s celebrate this special occasion with this marvelous chocolate truffle tart loaded with fresh strawberries and coconut. 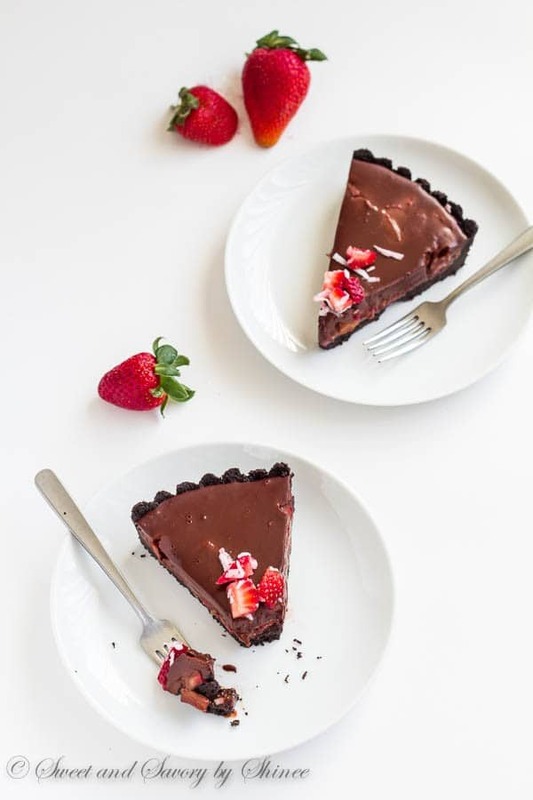 This tart is every chocoholic’s dream-come-true dessert, from the crumbly Oreo cookie crust to rich chocolate ganache filling. It’s intense, it’s fruity, it’s melt-in-your-mouth delicious. My husband took his first bite and instantly exclaimed, “It liquefies in my mouth!” And I replied, “Duh, it’s melt-in-your-mouth delicious. It’s supposed to do that.” 🙂 And he agreed, it was delicious! Rich chocolate ganache filling is poured over mix of fresh strawberries and coconut flakes, which cuts down the richness of ganache and adds light fruity flavor. In my testing, I found that using a mix of semisweet and bittersweet chocolates yields the best balance between sweetness and richness for me. And it couldn’t be easier to make this tart. First, we chop up the strawberries into small bite-size pieces and combine with sweetened coconut flakes. Chopping the strawberries makes it easier to cut the tart later on. So the smaller the pieces, the better. And then we crumble the Oreo cookies and mix it with melted butter to make the best chocolate tart crust. It’s sturdy, flavorful and adds perfect texture to the tart. Next, we bring the coconut milk to a simmer and pour it over the chocolate chips to make the ganache. My foolproof method to make any ganache is to pour the hot milk over the chocolate and let it sit undisturbed for at least 2 minutes. Then when you whisk the mixture, it’ll turn into smooth luscious ganache. If for whatever reason, you still have solid chocolate pieces and the mixture is cooled too much, simply heat it in double boiler over simmering water until completely smooth. In the final step, we pour the ganache in to the crust filled with strawberry-coconut mixture. Don’t forget to reserve about 1/3 of strawberry mixture to decorate the tart later on. Have a fantastic week ahead! And thank you for stopping by. 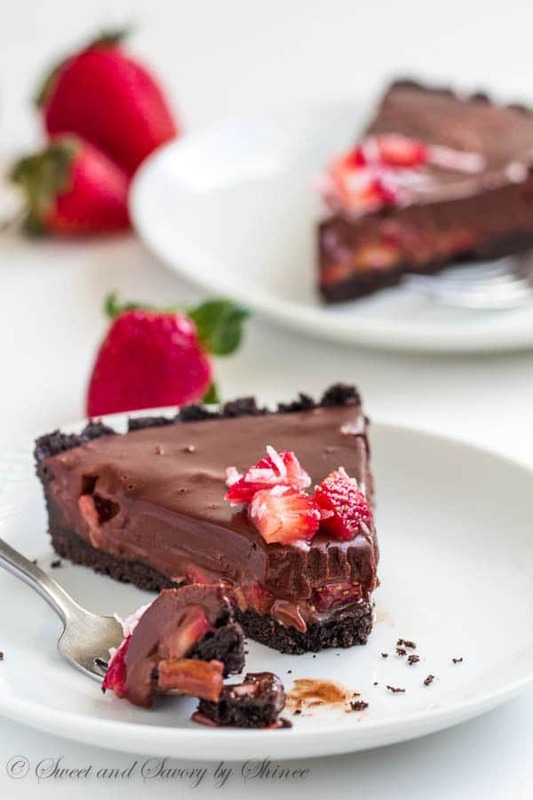 Every bite of this no-bake chocolate truffle tart, filled with fresh strawberries and coconut, literally melts in your mouth! Chop the strawberries into small bite-size pieces and combine with sweetened coconut flakes. (Chopping the strawberries makes it easier to cut the tart later on. So the smaller the pieces, the better.) Set aside. In a food processor, pulse the Oreo cookies to fine crumbs and mix it with melted butter. Press the crumbs mixture evenly into 9-inch tart pan with loose bottom. Refrigerate while you make the ganache. Reserve about 1/3 of strawberry mixture for later and spread the remaining mixture evenly in the tart crust. Then pour the ganache. Refrigerate for at least 2 hours to set. 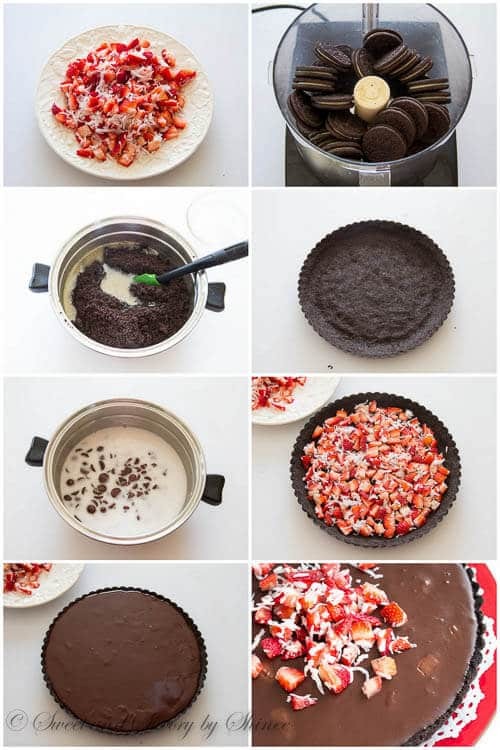 Before serving, decorate the top of the tart with reserved strawberry mixture. Serve the tart chilled. Store the tart in the refrigerator for up to 3 day, covered.